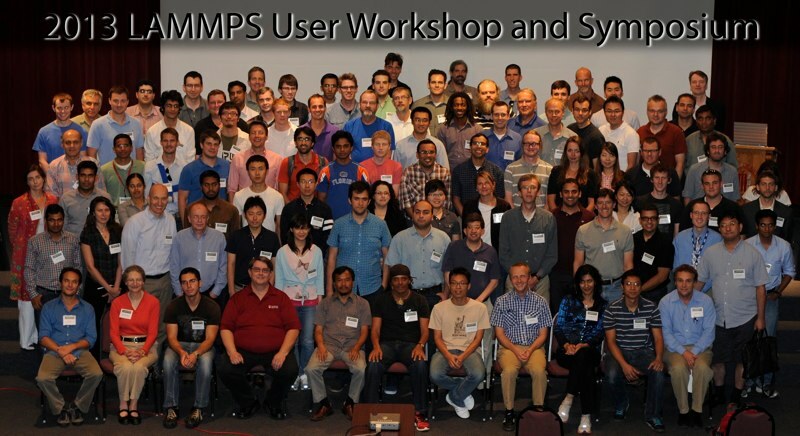 The third LAMMPS workshop and symposium for users and developers was held in Albuquerque, NM on August 7-8, 2013. A special session for beginners was held on August 6, 2013. Abstracts for most of the posters and talks are available through click-able links below. A list of workshop attendees can be found here: attendees. All sessions were held in the UNM Continuing Education Building, (1634 University Blvd. NE, map). An introduction to LAMMPS designed to get attendees up and running with LAMMPS quickly. Beginning with downloading and building, these tutorials will highlight major components of the code with an emphasis on examples and demos. Bring your laptop computer with LAMMPS already installed if possible (and other relevant software already installed if possible: VMD, Pizza.py, a movie maker software package, and Cygwin might be useful if you've got a Windows laptop, MPICH). There will be opportunities for discussion, hands-on work, and questions at the end of each tutorial. 3:30 Lammpsfe - user interface for LAMMPS, (abstract), Valeriu Smiricinschi, Scifes Inc.
2:26 LAMMPS Simulation in the Investigation of Dimensional Changes in Zirconium in the Presence of Alloying Elements and Hydrogen, (abstract), Clive Freeman, Materials Design, Inc.